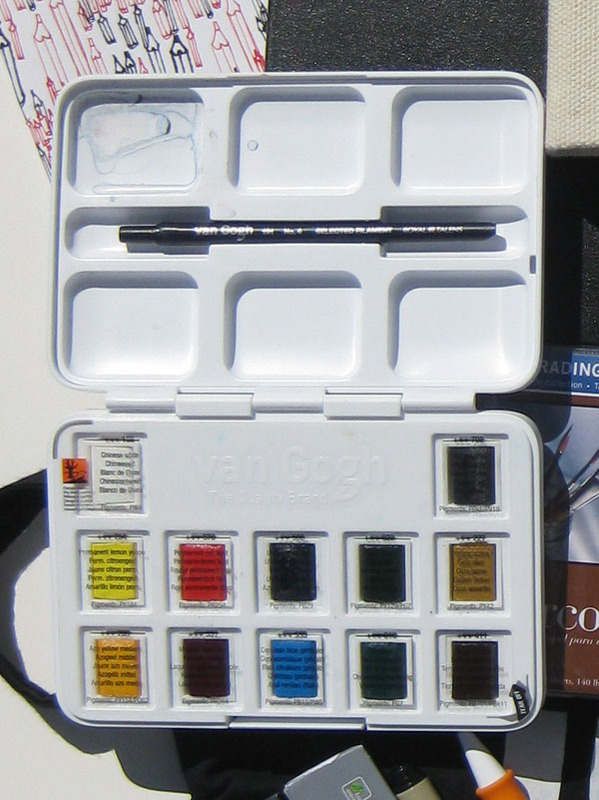 Van Gogh portable watercolor kit. 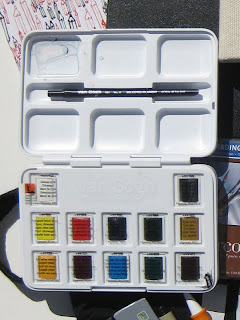 mention another item I started using recently: the mixing tray that came with a portable Van Gogh watercolor set. The kit’s not bad as far as portability goes, but it’s still not nearly as small as my Trader Joe’s mint tin kit, so I figured I wouldn’t use it. As I examined the lid, I saw that the mixing tray could be removed without damaging the kit, so I pried it off. The Van Gogh kit mixing tray is the same width as the Koi kit mixing tray that I was using most recently and about a half-inch longer. 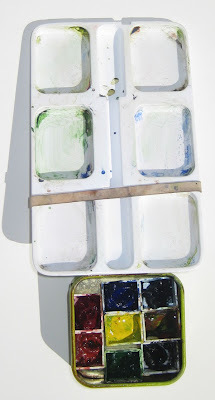 (To see the complete series of mixing trays, see the blog post “Coming Full Circle.”) I miss the larger mixing areas that the Koi tray has, but the Koi’s very shallow wells can be a problem (I’ve had several mishaps when the tray attached to my sketchbook wasn’t level, and the colors mixed together into a muddy mess). The Van Gogh tray has mixing wells that are slightly deeper, so getting the colors unintentionally mixed is no longer a problem. Van Gogh mixing tray attached to mint tin. 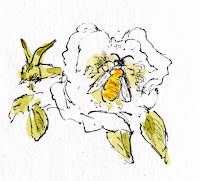 I usually use a waterbrush, but occasionally I need to use a traditional paint brush. The Van Gogh wells are deep enough that I’ve been able to fill one with clean water and completely saturate a brush. So in a pinch, the wells can be used as water containers. It’s slightly heavier than the Koi tray, but the difference is negligible. I’ve been using the Van Gogh tray the past month with no functional issues. As far as the paints go, I heard several symposium participants say that they seem to be of good quality, so I might try popping out the half pans at some point and putting them into my mint tin. 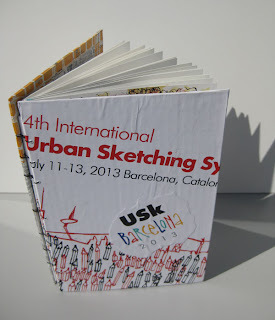 One of the many sketchbooks I received from sponsors at the Barcelona Urban Sketching Symposium was a Moleskine accordion-folded (Japanese style) sketchbook containing watercolor paper. 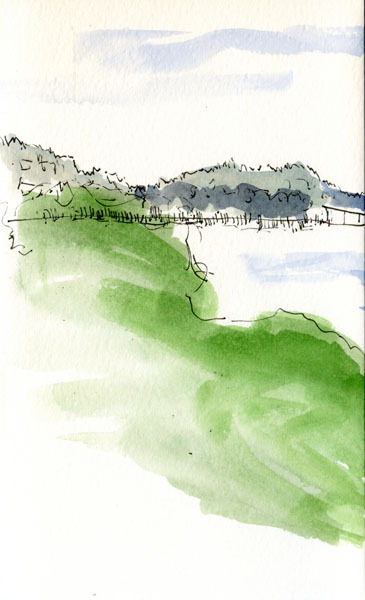 The paper is the same as Moleskine’s landscape-format watercolor book. It must be a custom edition that was produced just for the symposium, because as far as I know, Moleskine doesn’t sell this style of book. Although I’ve seen Moleskine’s Japanese-style sketchbook, it contains the usual waxy-surface, yellowish paper, not watercolor paper as this one does. (Of course, the coolest things about it are the Urban Sketchers logo and “I’m an urban sketcher in Barcelona” silkscreened on the cover!). When I saw that the book folds out into a single, 23-panel page, I knew I wanted to use it for a panoramic landscape sketch. 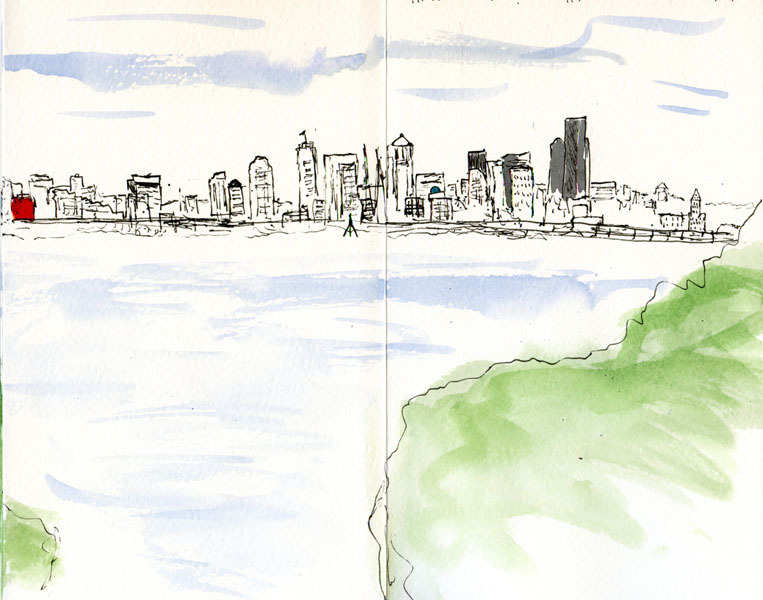 In the past when I’ve done skyline panoramas, I’ve used a landscape-format sketchbook to capture as much as I could in a double-page spread. But even with that format at Jack Block Park, I got only from the Smith Tower to Queen Anne Hill. It was easy to fold over each panel as I sketched, but to paint, I had to lay the panels out flat. Fortunately, there was a bench nearby that I could work on. 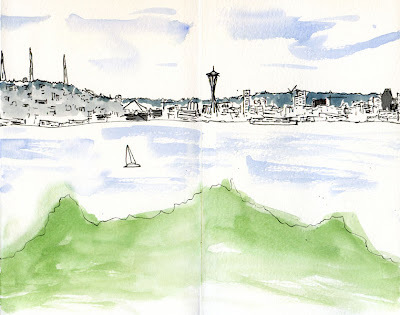 Unfortunately, the bench faced the view, so I had to keep turning around to look at the skyline as I painted. 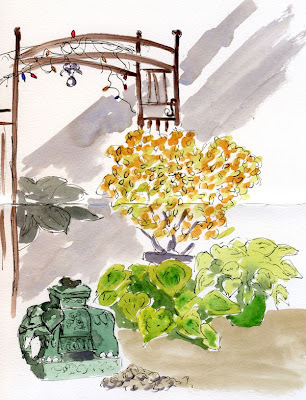 Our friend Beth has a serene and lovely garden in West Seattle. She’s Greg’s massage therapist, so while he got a massage, I spent an hour sketching a trellis, a couple of her many hosta plants with their broad, heart-shaped leaves and a ceramic elephant patiently carrying stones. It had been raining off and on all day, but around the time the farmers market was opening in Lake City, the rain was off, so I decided to chance it. Sure enough, just as I was arriving in the neighborhood, it started pouring, so I parked and then ducked into the public library next door to the market. 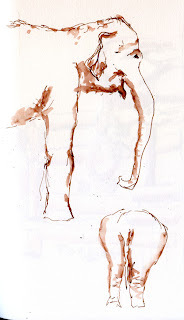 With a seat by the window, I sketched this fellow, waiting for the rain to stop. A few minutes later, it did, so I went back out to the market. I spotted blues singer P. K. Dwyer, whom I’ve sketched twice before – just a couple months ago at the Phinney Farmers Market and almost exactly a year ago at the same market. 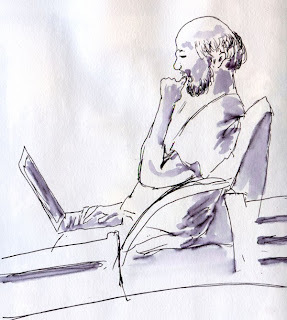 This time I thought I’d sketch a different view of him – from the back. I could still enjoy his toe-tapping music while making a wider composition. Only about 10 minutes into the sketch, raindrops the size of bullets started plopping onto my sketchbook page. I had to duck for cover again, but the way those drops were coming down, I could tell they weren’t going to stop anytime soon. I went home. Despite the abruptly aborted sketch, I do like the way the raindrops look on my page. After I finished my sketch of the Sri Chinmoy memorial, I climbed the stairs to the Fremont Bridge. This bridge, with its fascinating opening drawbridge and equally fascinating “language” of honks signaling when the bridge will give way to boats, opens an average of 35 times a day. Ponti Seafood Grill, one of my favorite restaurants, has a deck with a great view of the bridge, and it’s fun to have drinks or dinner out there on a warm summer night, watching the drawbridge go up and down. 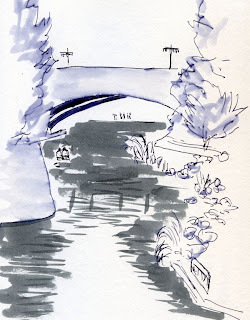 As a sketch subject, though, I’ve always been intimidated by that bridge. 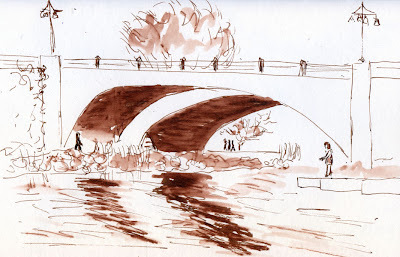 Although it’s not as complex or architecturally elaborate as some local bridges, it still has perspective issues, and so many things can go wrong. . . 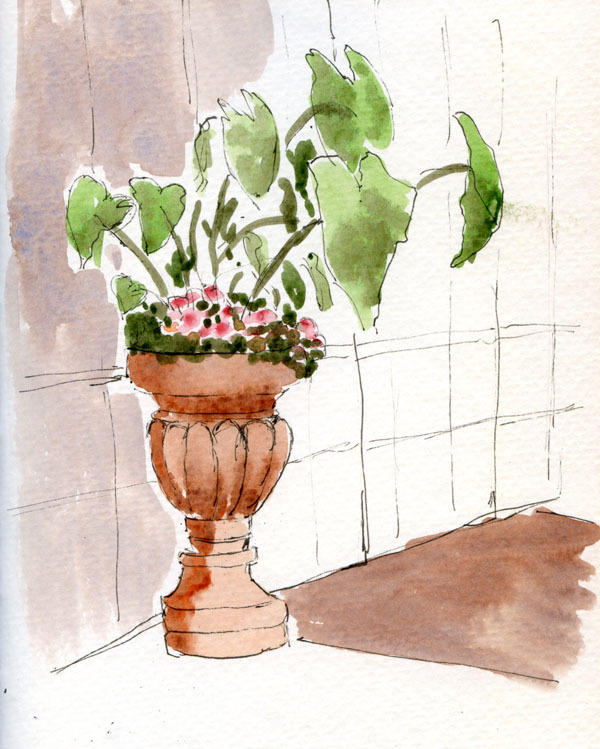 But as I marched up the stairs, I channeled Inma in Barcelona and remembered her suggestion to focus on the part of a building or structure that interests and engages me – and let the rest go. 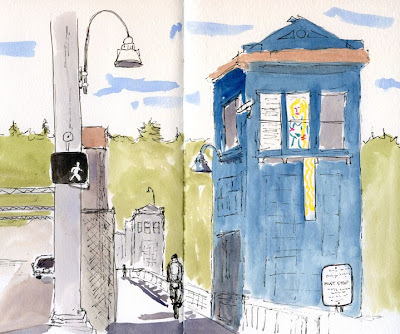 And what interests me most about the Fremont Bridge? That whimsical artwork (by Fremont glass artist Rodman Miller) of Rapunzel locked in the bridge’s tower. So I first focused on Rapunzel’s tower, and then I became interested in the shadows on the bike/pedestrian path. And then I realized the bridge wasn’t so bad after all. 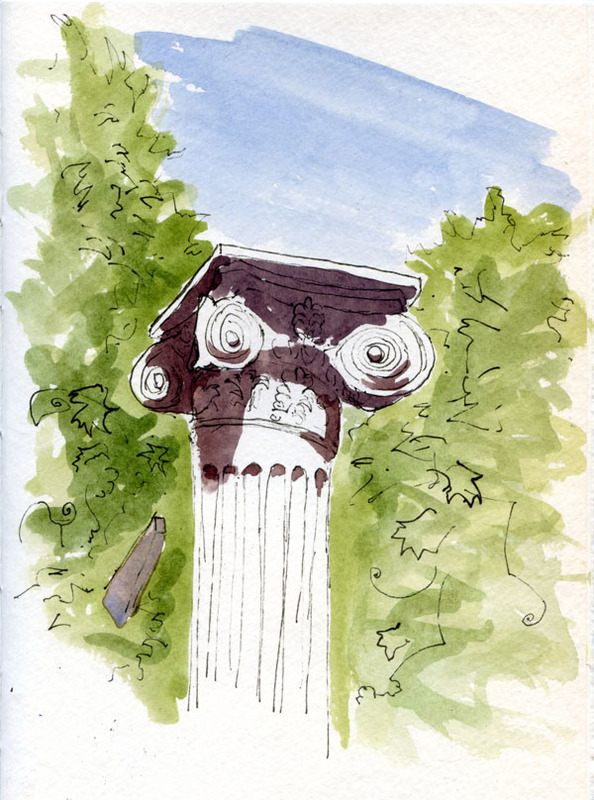 I didn’t have time to sketch the memorial then, but I made note of it. This week’s Urban Sketchers Flickr group theme is “Dreams of a Better Society,” so I thought it was the appropriate time to go back to the Ship Canal and sketch the statue. It was dedicated on Nov. 7, 2010, three years after his death. Something in the Costco parking lot stopped me short: A small maple tree that was almost entirely red! 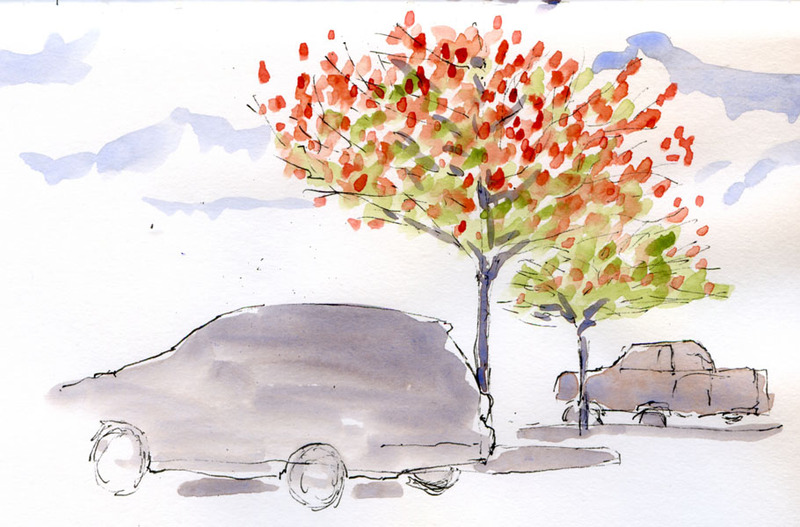 Maybe those small parking lot trees turn red prematurely! Maybe it – and several other trees in the same lot – is just a fluke! Maybe it’s all this dry weather we’ve been having! 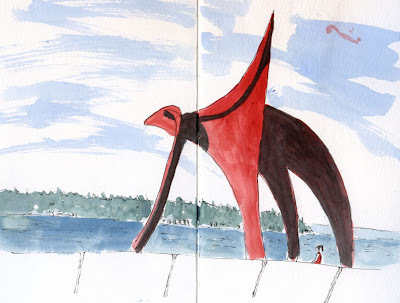 Back in April when I was looking for local oddities to post on the Urban Sketchers Flickr weekly theme thread on the same subject, I headed north on Aurora Avenue North, which seemed full of oddities (including a three-dimensional elephant on a sign) when I was a child. My theory stands. 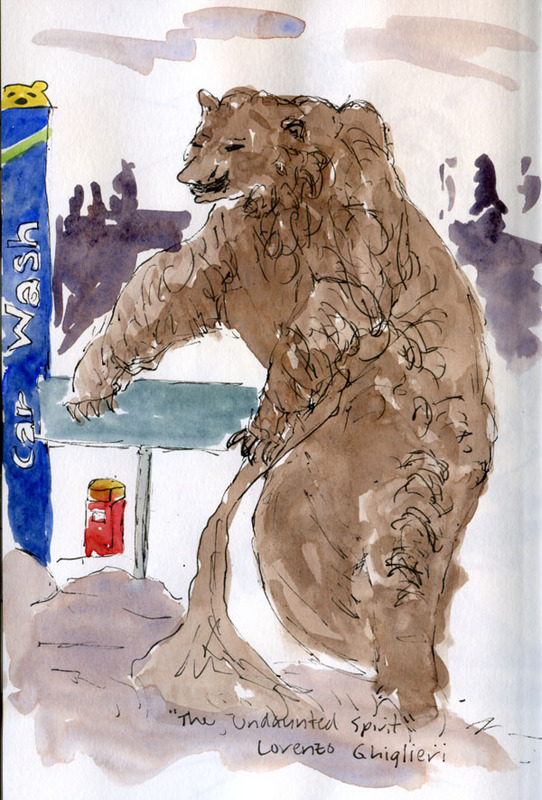 On our way to Costco a few days ago, we passed another oddity that I had never noticed before: a huge bear sculpture at the Brown Bear Car Wash on 160th and Aurora. If you’re familiar with Brown Bear Car Wash, apparently a regional chain, you know that its logo is of the “teddy bear” species, or at least a type of bear that evokes friendliness and not fear. The bronze bear at 160th and Aurora is definitely not of the same species. Titled “The Undaunted Spirit,” the sculpture by Lorenzo Ghiglieri was commissioned by the owners of Brown Bear in 2009. 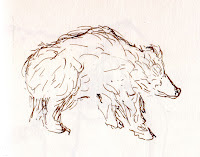 Indeed, the realistic grizzly is somewhat daunting – rearing up, long claws and teeth bared. 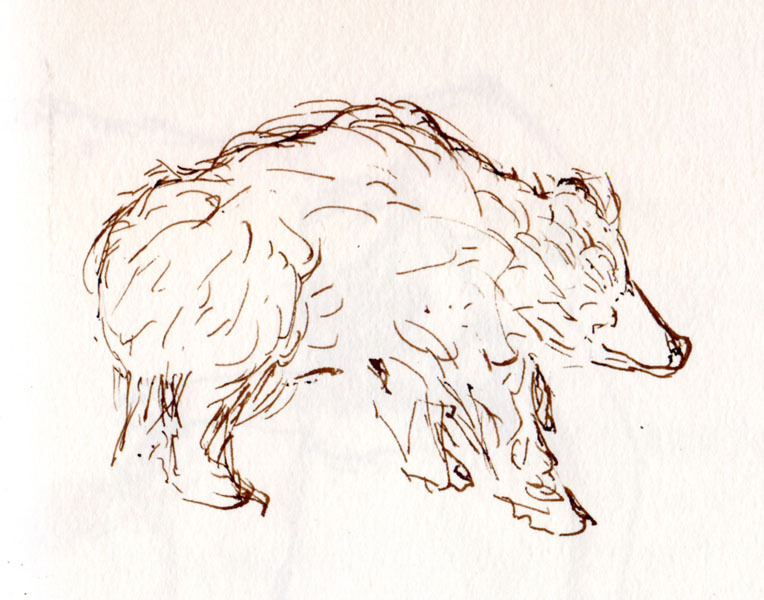 Unlike the elephant sign, I wouldn’t call the bear “odd” at all; it’s actually quite beautiful. Its placement on Aurora Avenue, however, is a little odd. If you’ve seen Barcelona’s Sagrada Familia only once, then it wasn’t enough. 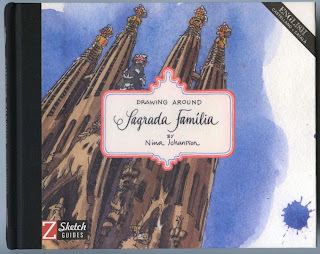 That was my conclusion as I savored the amazingly detailed drawings in Drawing Around Sagrada Familia by urban sketcher and blogger Nina Johansson. I spent the whole day at Gaudi’s masterpiece cathedral, exploring both the outside and inside with sheer awe and wonder, and Johansson’s art helped me relive that experience. 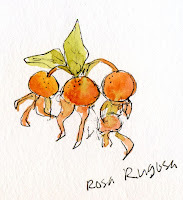 Yet with each beautifully rendered drawing, I kept wondering how I could have missed this detail or that. She has carefully observed subtle nuances as well as the grand picture. Unlike photographs, Johansson’s drawings convey not only what is seen but what is felt by the thousands of tourists who pass through the Sagrada Familia daily. More important, the drawings convey what Johansson herself felt as she transferred keen observations to her sketchbook with intelligence, reverence and humor. Only three sketchers showed up for the Friday ad hoc gathering, so we rattled around in the spacious Bellevue Botanical Garden. Currently under major renovation to make it even larger, the BBG is deep and full of tall trees, making it seem more like an arboretum than a traditional garden. Still at work on my latest sketching nemesis – fountains and other sources of streaming water – I first tackled a lovely series of waterfalls in the Yao Japanese Garden area, where the wide leaves of the Darmera Peltata opened like umbrellas beside the rocks. 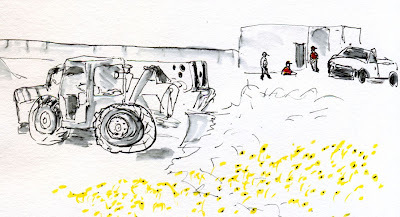 In the few remaining minutes before our meeting time to share sketches, I wandered over to the construction area and dashed off a large bed of black-eyed Susans lending color to heavy machinery and construction workers taking a lunch break. 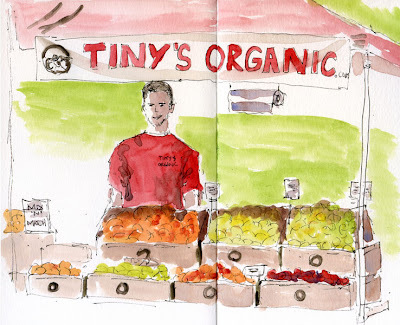 Despite all the fruit I buy at farmers markets during the summer, when I saw that this week’s Urban Sketchers Flickr group theme is “Fruit” (a theme, in fact, that was suggested by me) I was chagrined to find that I did not have a single sketch of a fruit vendor! I made it my goal to correct that omission this week at the Lake City Farmers Market. 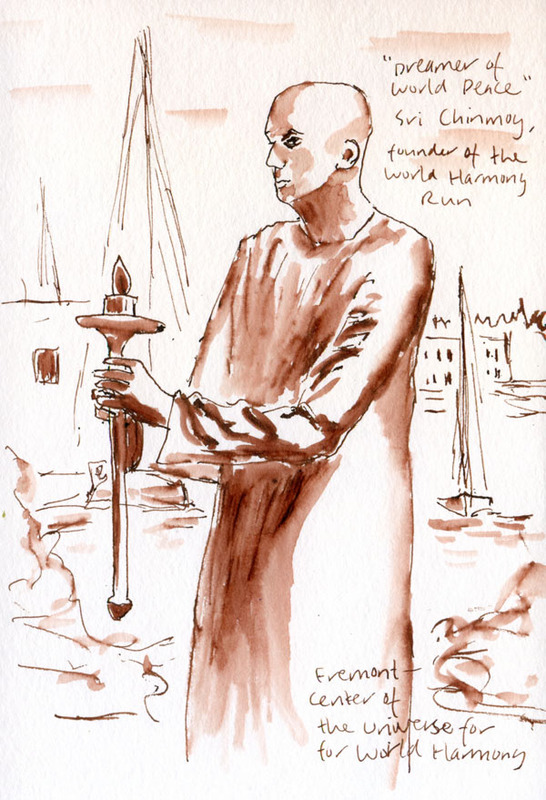 It probably looks like this sketch-genic vendor was posing for me, but I was actually a distance away, and I’m not sure he was aware of my sketching. He just always seemed to have a ready smile for his customers. With only a few minutes left before I had to go, I noticed a couple of buskers I hadn’t seen before. One was a poet sitting at a small table, apparently selling poems. 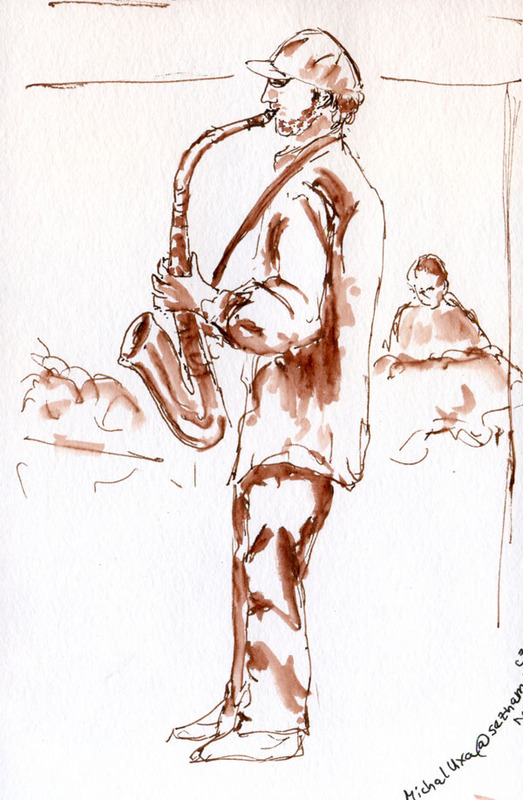 But this sax player named Michal won my sketchbook’s attention. Maybe I’ll catch the poet next time. My everyday Rickshaw bag nested inside the new "medium" travel bag. Greg always says that finding the ideal bag is my Holy Grail. I’ve accepted this as my life’s purpose. 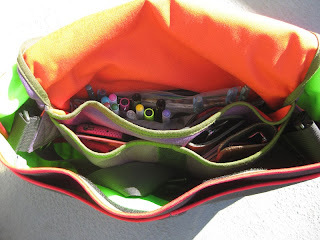 Before I became a sketcher, my default travel carry-on bag was always a conventional backpack. I would shove my purse in there, along with a book or two, a water bottle, snacks, ear plugs, a sweater for overly air-conditioned airplanes and other travel essentials. It served its purpose well. 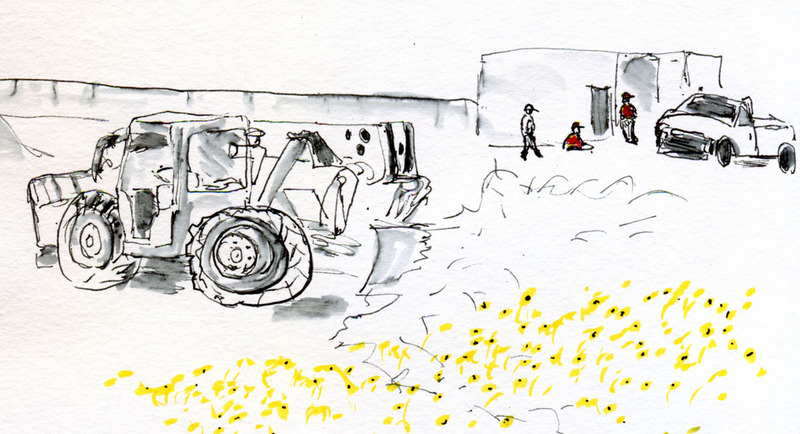 But after I became a sketcher, everything changed. My everyday (and now famous) Rickshaw Bagworks Zero Messenger Bag wouldn’t fit in the backpack unless I turned it sideways, which made the bag’s flap and contents nearly inaccessible. So for a couple of domestic trips, I used a Nomadic Wise-Walker messenger bag, which has a gazillion compartments and a multitude of zippered or Velcroed pockets. At first this bag seemed like a good idea, because all those segregated spaces meant that I could organize my art supplies to the hilt. Of course, this pleased me visually – everything tucked away beautifully. But in the real sketching world, I kept forgetting which pockets held which items, so I was constantly unzipping and rummaging around. For one trip I left the Rickshaw behind and simply moved all my supplies to the backpack’s pockets, but it meant I had to carry the backpack everywhere as my purse. It also pointed out the key reason why I don’t like backpacks generally: Everything is in back, inaccessible to me while I’m carrying it. When planning for the symposium, I kept hearing that backpacks were a bad idea in Barcelona, the pickpocket capital of the world, because the outer pockets in back were so easily accessible to thieves. So I decided to try the Nomadic Wise-Walker again. It seemed to work out fine during my dry run. That turned out to be the biggest equipment failure of the trip: On the crowded sidewalks of Barcelona, I kept bumping into people with its bulk. And one of the primary recommendations for avoiding pickpockets is to blend in with the crowd. While this type of urban bag is popular in the U.S., I looked around me in Barcelona and didn’t see any. TOURIST was written across my forehead. I ended up using a flimsy tote bag as my sketch bag for the rest of the trip. Needless to say, I’ve been thinking about a replacement carry-on bag ever since. 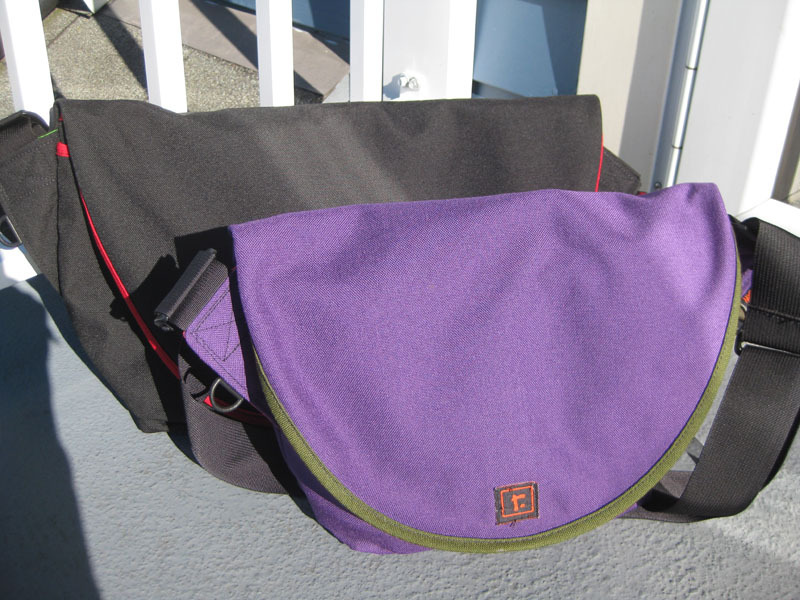 The answer came in the form of a special e-mail offer from Rickshaw Bagworks: All Zero Messenger Bags were half price for a very limited time! My trusty purple Rickshaw bag is the “small” size. The “medium” size is significantly larger, but the dimensions still seemed reasonable for me to carry easily. 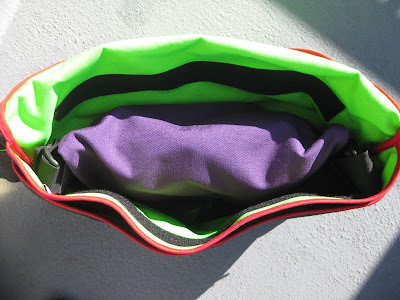 But here’s the beauty of it: All Zero Messenger Bags have the same shape, so I knew my smaller one would nest perfectly inside a larger one, with additional space for all the other things I have to carry when I travel. I also knew that the empty bag is lightweight – much lighter than either my backpack or the Wise-Walker – so even a larger one wouldn’t add much weight of its own. I ordered a medium size in black (to hide travel dirt better) with a bright green lining (to make it easier to see things inside and to look sharp against the purple bag). nested inside the larger bag. On my trip to the Twin Cities last week, I gave it a first whirl. As I had hoped, my small Rickshaw bag fits perfectly inside, and its contents are fully accessible from the larger bag because both flaps open the same way. I had plenty of space for all my other stuff (room to spare, in fact, but I didn’t want to add to its weight by filling it up). I wore the strap cross-body, and when walking, I swung the bag to my back out of the way. When I needed to get into it, I swung it to one side. 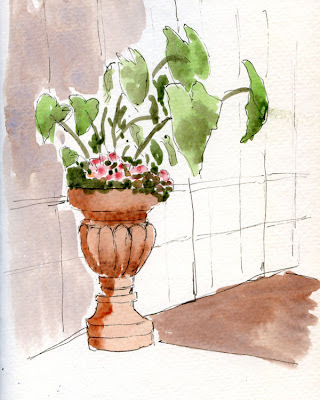 Once we reached our hotel room, I pulled my smaller bag out and used it as I do at home – everything still in their familiar places, no new compartments or pockets to figure out and rummage through. The only downside – and it might be significant – is that carrying the weight of both nested bags on one shoulder instead of distributed on my back and both shoulders as in a backpack started to get heavy quickly. It means I’m going to have to pare things down – both in my everyday bag as well as the outer travel bag – if I’m going to continue using this combo. (Yes, I know my bag did lose weight before the European trip, but as we all know, weight always has a way of creeping back on.) But when traveling, less (to carry) is always more, so paring down is a good idea in any case. I’m on it. My Rickshaw bag and her big sister. Although I knew our trip to the Twin Cities wouldn’t be a long adventure with lots of sketches, I decided to take along my “Stefano” sketchbook system anyway (as I’m planning to use it as my everyday sketchbook soon). And since flexibility is one of its key attributes, I took full advantage of it this time. The signatures I stitched up for Barcelona/Germany served me well on my travels, and the paper in them – 100-pound Canson Biggie watercolor paper that I happen to have a huge stack of – is similar enough to 100-pound Stillman & Birn Alpha paper that it felt familiar and comfortable. It’s ideal for pencil, markers, and pen and ink, and it even holds up sufficiently to light watercolor washes. 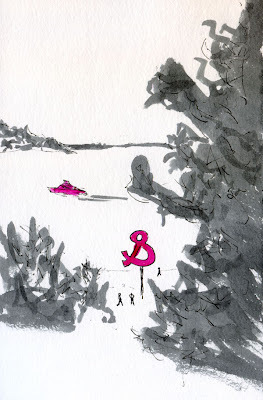 But I have been wanting to find a paper closer to the 180-pound Stillman & Birn Beta paper that I have come to appreciate with heavier watercolor washes. Although I’ve been told they perform beautifully, I was reluctant to invest in high-end watercolor papers that can cost $5 per sheet or more. So shortly before my recent Minnesota trip, I purchased a pad of Strathmore 140-pound watercolor paper. With a discount coupon, the price worked out to about a dollar per 18” x 24” sheet, which is reasonable for my budget and intended purpose. I took along a signature of 100-pound paper that was leftover from the ones I stitched previously. 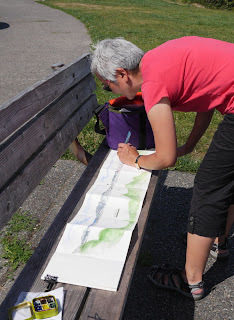 In addition, I also stitched up a signature of the 140-pound Strathmore. The heavier paper meant that I could bind only six pages per signature (instead of eight for the 100-pound paper), but since the dimensions are identical, I could use the same punching template. (More important, I didn’t have to do any additional page-measuring and cutting calculations, which means, for me, eliminating new possibilities for error!) The Stefano cover has two elastic signature holders, so I could carry both at the same time, side by side. 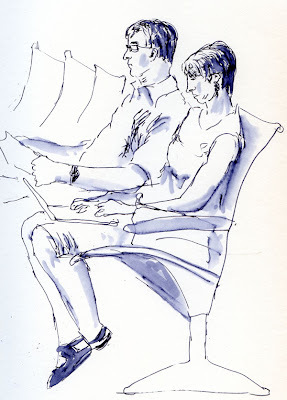 It’s somewhat customary for a traveling sketcher to begin or end a trip with airport or plane interior sketches. 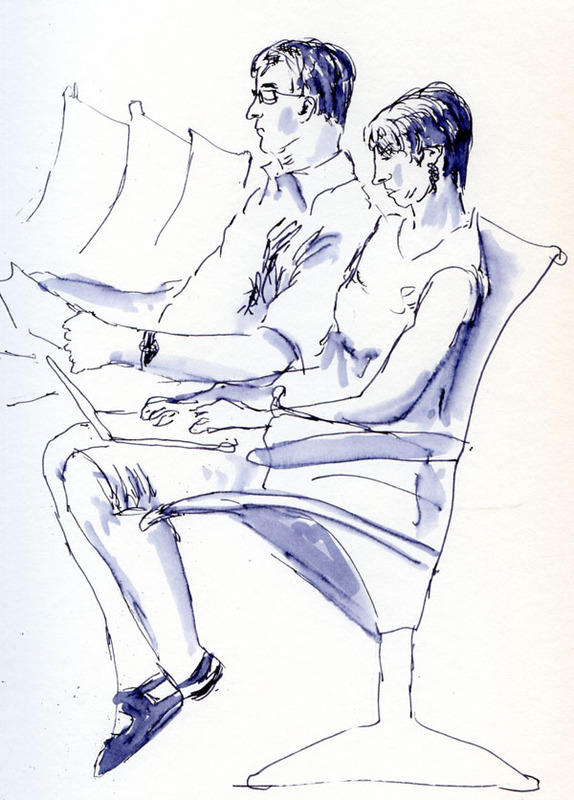 I chose this couple waiting at the Minneapolis-St. Paul Humphrey terminal as my closing sketch for this short but sketch-worthy trip. It’s good to be home again! Strolling through clean and serene Centennial Lakes Park, which has soft music wired in (yes!) among the trees and gardens, we started hearing live music playing in the distance. 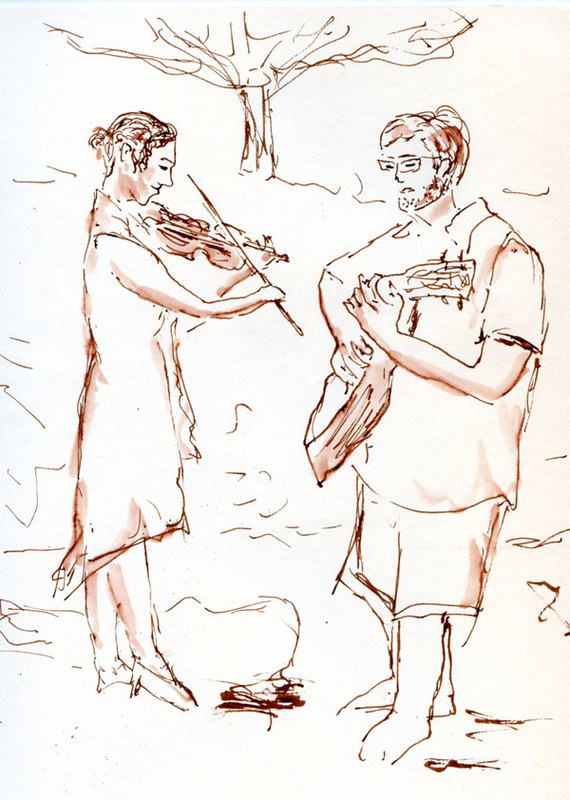 Eventually we came upon the source: A young woman playing a violin, and a young man playing a guitar as he sang. Although their instrument cases were open at their feet, they somehow didn’t seem like ordinary buskers. For one thing, they faced each other and seemed to be playing for each other more than to an audience (which was nonexistent before our arrival). They played several tunes, and at the end of each engaged in delighted conversation with each other. When I finished my sketch, I placed a couple bucks in one of the open cases, and they immediately protested and gave the money back, laughing and embarrassed. It turned out that they weren’t buskers at all – at least not anymore. Six years ago, Kathleen and RJ busked together on a whim and made 65 Euros in a few hours. They pointed to a photo of themselves back then that was still taped to the inside of the guitar case. A few minutes after the photo had been taken, authorities told them busking without a license was prohibited, and their brief career came to an end. But obviously that wasn’t the end of their friendship. Reunited for the first time in six years, they were thrilled to be making music again together, and I felt privileged capturing it. 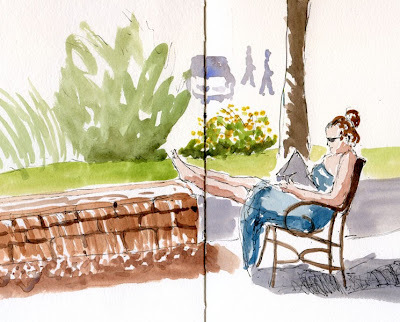 A highlight of my few days in the Twin Cities was joining the Twin Cities Urban Sketchers for a sketchout last Saturday morning. A few weeks ago, I posted a note on their Facebook page to see if any sketch opportunities were coming up on the days I was to be in town, and Amber suggested an outing at the Mill City Farmers Market. Amber, Daniel, Jodi and Patty welcomed me warmly, and Daniel turned out to be a familiar face – we had been in a workshop together in Barcelona! Amber, too, had been at the Barcelona symposium, but our paths didn’t cross until we gathered on the steps of the Guthrie Theater, right across the street from the market. Usually at farmers markets, I like to sketch street musicians, face painters or other people working at the market. 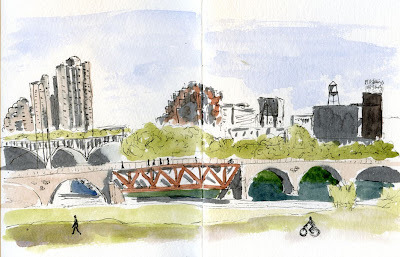 But since I was in the heart of Minneapolis, I used the vantage point of the Guthrie steps to sketch two bridges crossing over the Mississippi River and some of the skyline, including the iconic Pillsbury’s sign. 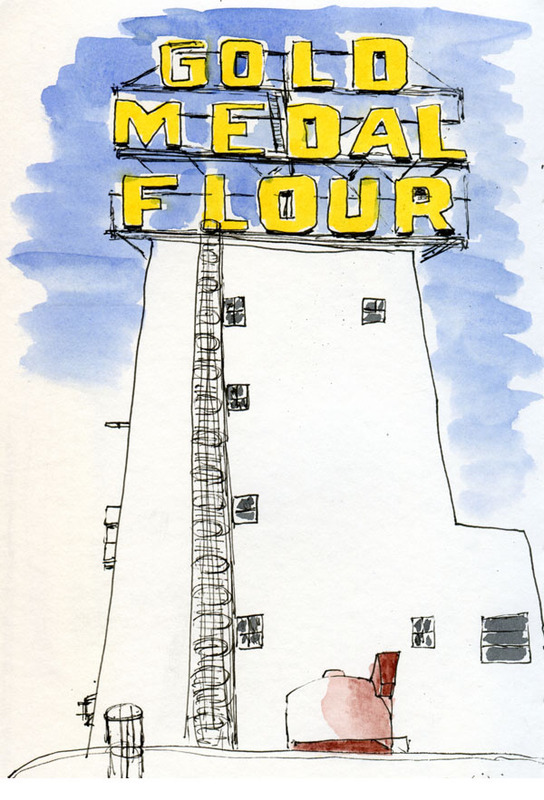 In keeping with the milling heritage of the area, I turned 90 degrees, looked straight up, and sketched the Gold Medal Flour sign, another icon, still atop the former flour mill building that now houses the Mill City Museum. 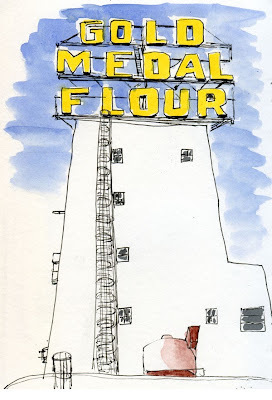 My thanks to Amber, Daniel, Jodi and Patty for a memorable sketchout! 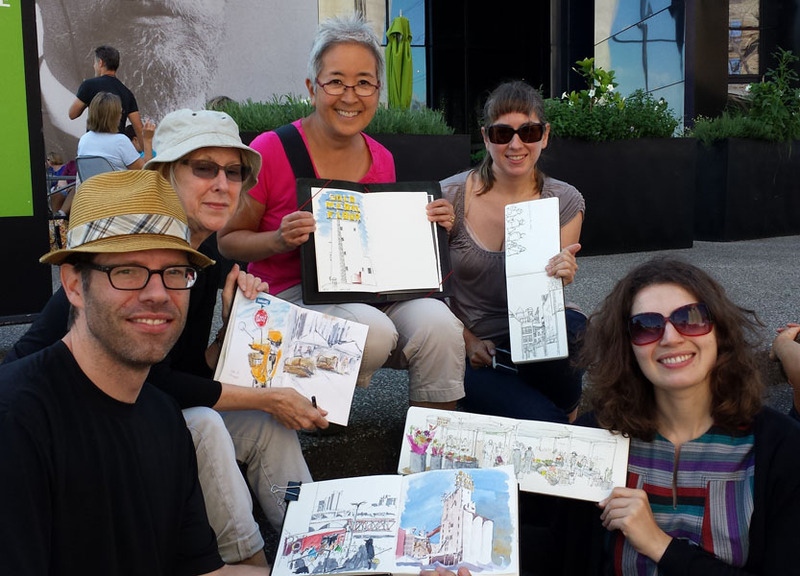 It’s terrific to be part of the huge network of Urban Sketchers. I’m back from a few days in the Minneapolis-St. Paul area, where the weather was unbelievably sunny, warm and not humid (which was a wonderful surprise for this time of year). 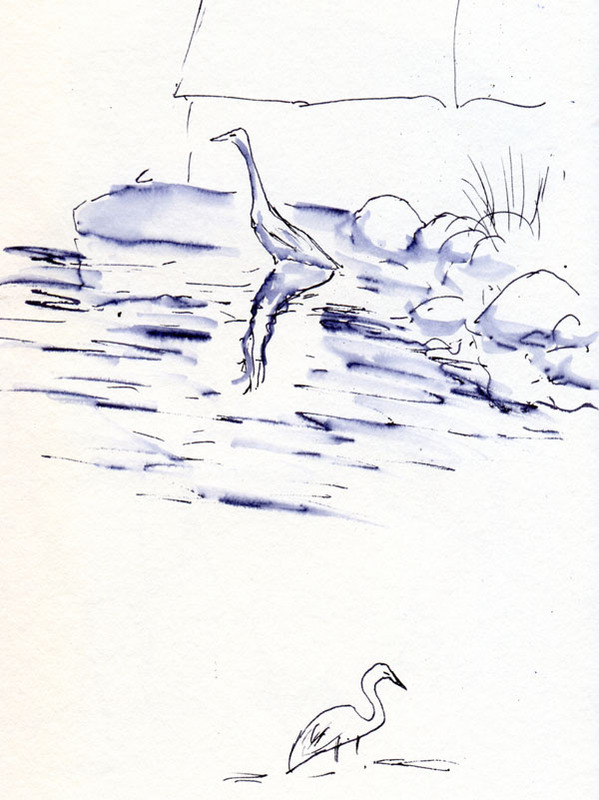 Needless to say, we spent most of our time there outdoors, and even though we were with family most of the time, I managed to grab several sketches here and there. Centennial Lakes Park in the posh Edina neighborhood is a beautifully landscaped manmade lake surrounded by condos, office buildings and an easy, mile-and-a-half walking path. 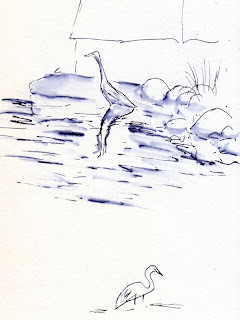 We liked the park so much that we went twice – once in the evening (when I sketched a pair of bridges over the lake) and once in the morning (when I caught a heron with my sketchbook). One of the most tranquil urban gardens I have ever visited, Noerenberg Gardens is on Lake Minnetonka. I could have spent the whole day there trying to capture the colors and shapes. Instead, I focused on one of several reproduction columns arranged in the center of the garden as a memorial to the founding family. What am I up to? Check out Amber Sausen's report on the Twin Cities Urban Sketchers blog. Stay tuned for my own report and sketches soon! The overcast sky and stiff wind were clues, but the temperature read 75, so I took the top down and headed out for the Wallingford Farmers Market. 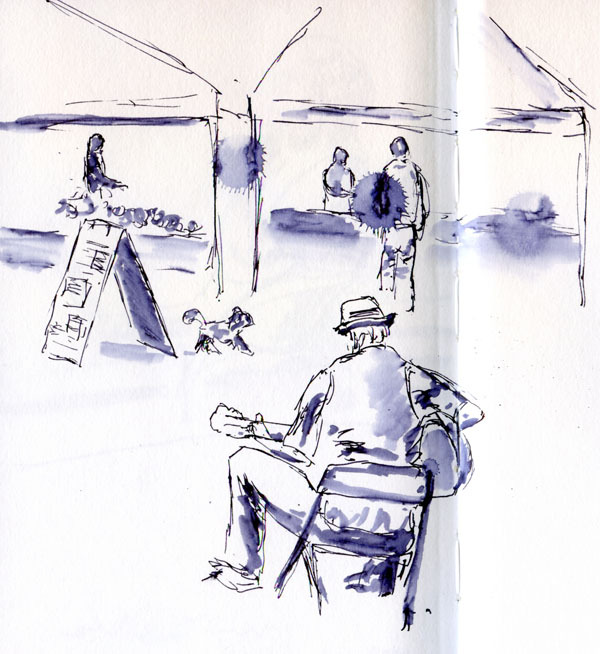 Maybe the musicians knew something I didn’t, because none were to be found at this market that is usually popular with buskers. 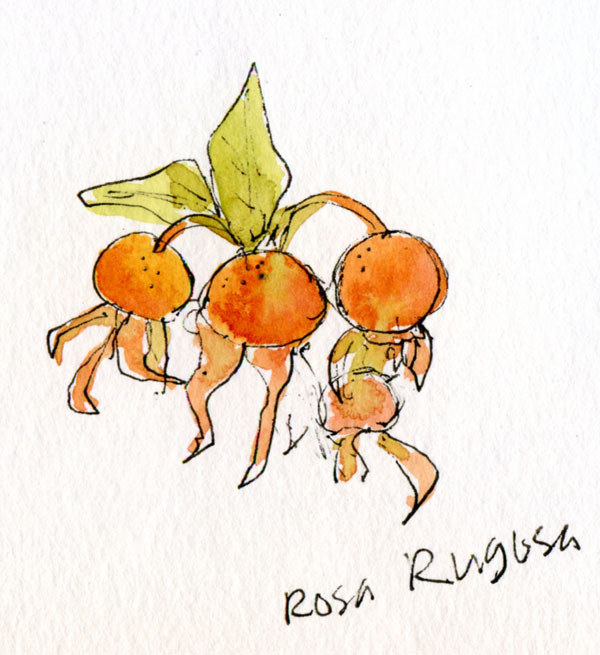 Without my usual farmers market “victims,” I set out to find new ones. 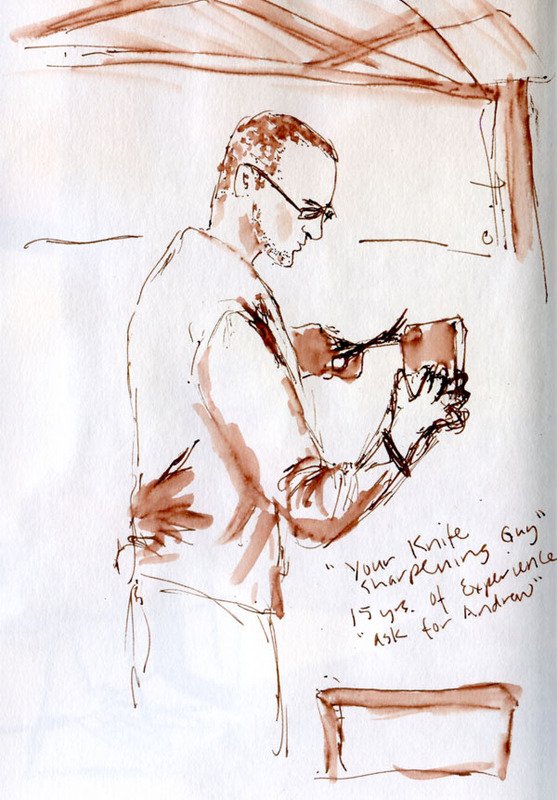 My first was Andrew, Your Knife Sharpening Guy, who has been sharpening knives by hand for more than 15 years. I walked around to the back end of the market and found a cooking demo in progress by chef Kailee Krupa and her team from Burgundian, a Wallingford neighborhood bar and restaurant. I was about to ask her more about the restaurant when the sky suddenly opened up, splattering my sketch with huge drops. Quickly making my rounds to pick up corn for dinner and a copy of Real Change from Yemane (whom I sketched a couple weeks ago), I ran out to my drenched car, popped the top up and drove home. Where the heck did that fountain go? 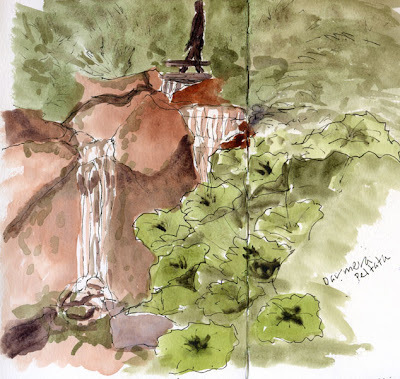 A year ago I sketched an interesting fountain at University Village, where I had used a white opaque gel pen to depict the streams of water. I wanted another crack at my latest sketching nemesis, fountains (or, more specifically, the water streaming out of them), and depicting the water with paint only. I walked around U Village at least three times this afternoon looking for that fountain before I figured out that it must have been removed with the ongoing construction there. So I had to keep looking for something else to sketch. Not exactly a fountain, this “water feature” looks like a brick wall, but water pours out from between the bricks as if the wall is leaking. Painting the water wasn’t going the way I had hoped, but I found myself getting more interested in sketching the young woman sunning her legs, anyway. She makes it sound so simple! Imagining that the technique she described has got to be one of the most difficult things to accomplish with watercolor, I was intrigued and determined to give it a try (so call me a masochist). I knew of a fountain at Northgate’s Thornton Place with multiple streams of water, so I gave it a shot. I was right: It’s got to be one of the most difficult watercolor techniques. (And never mind the tree gone wild in the background.) But now that I understand her technique, I’m going to give it a shot whenever I see a fountain. Hey, a new sketching nemesis! Not that I’ve conquered cars, trees and architecture yet, but there are fewer fountains in Seattle than any of my other sketching nemeses, so they won’t haunt me quite as often. We’ve been back from our European travels for three weeks now, and I finally finished binding the loose signatures of my sketchbook. I don’t like leaving projects unfinished, so it’s nice to have a sense of closure on a memorable, meaningful trip. 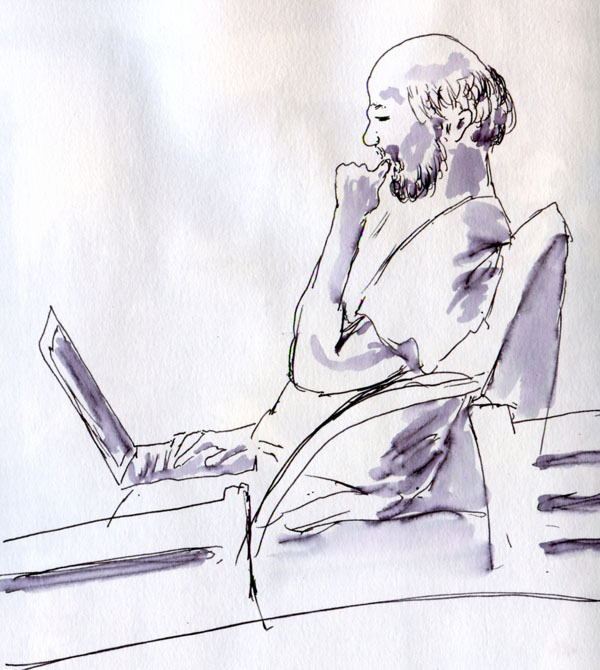 You may recall my hemming and hawing about whether to bind all the signatures into a single volume, or separate the symposium workshop exercises into a separate book. On the one hand, the Urban Sketching symposium was the impetus for the trip, so sketches done in the workshops seemed like they should be integrated with the rest of the sketches. 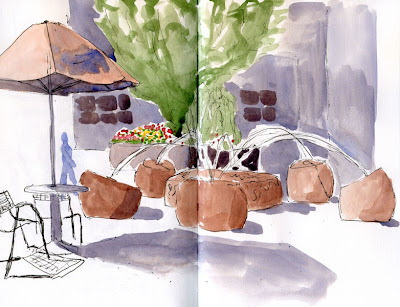 On the other hand, most of the work done in workshops were incomplete or mechanical exercises, and the subject matter were often gesture sketches of people or value studies of café umbrellas – content that doesn’t indicate the location. They don’t seem to fit in with the rest of my travel sketches. 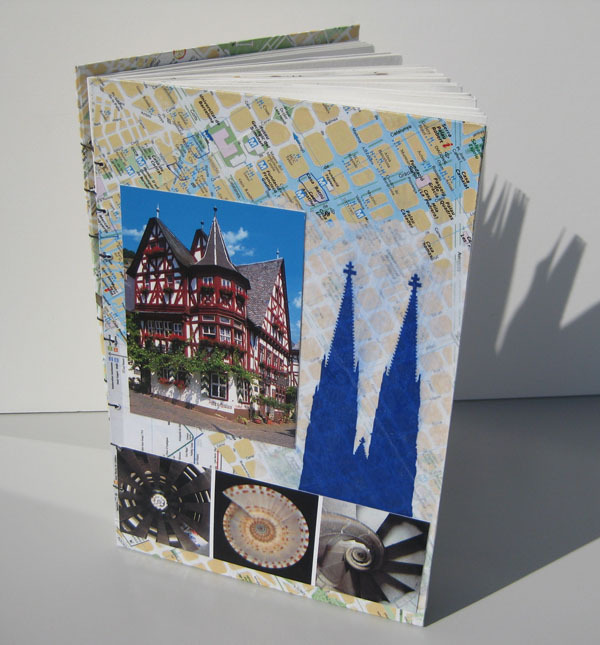 In the end, I decided to bind the workshop exercises separately, partly because of the reasons stated above, and also because the book would have been quite thick if I put all the signatures into a single volume, and I was concerned that the binding would be compromised. 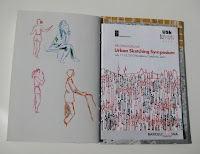 The front cover of the workshop sketchbook is a collage of a small poster we received and the symposium logo. The back cover is a map of Barcelona. 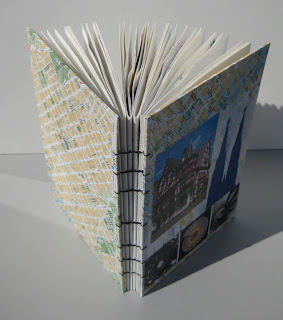 The thicker travel sketchbook’s covers are also made of maps and a collage of postcards and other ephemera. I used a few blank pages in both sketchbooks to hold more postcards, cards I traded with symposium participants and other keepsakes. ﻿﻿One excellent feature of the Coptic binding stitch I used is that the signatures do not have to be exactly the same size to be bound together. I removed the staples from the symposium program (which is slightly smaller than the signatures), punched holes to match the sketchbook signatures, and bound the program right into the back of the sketchbook as a keepsake (a much better place for it than a file folder or bookshelf, where I’d never find or look at it again). 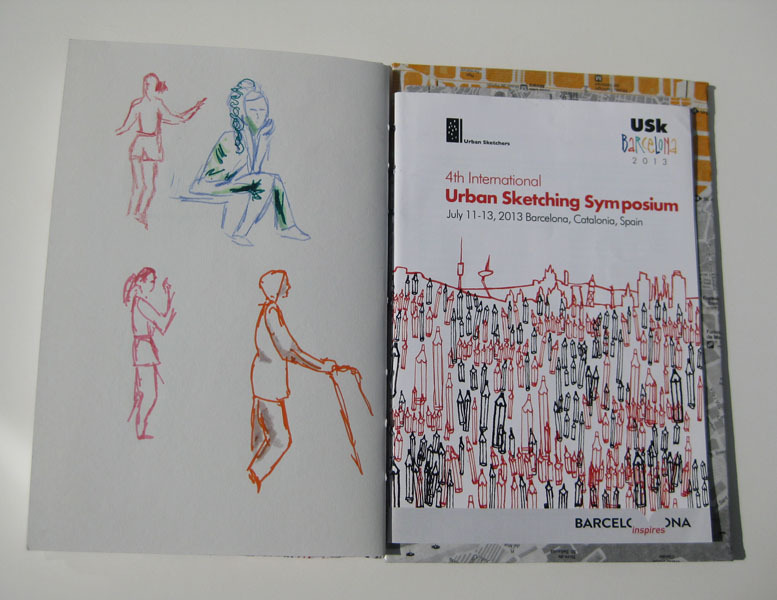 Symposium program bound into the sketchbook. 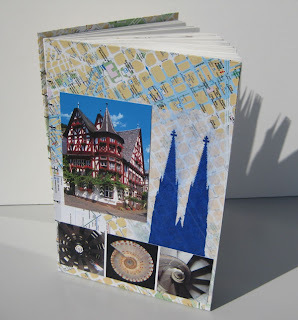 Now that I’ve completed the entire process of my first handbound sketchbooks (which began with my “Stefano” sketchbook cover and temporarily binding the signatures that I took with me on my travels), what do I think about it? And will I continue to use it for my day-to-day, non-travel sketches? The parts about bookbinding that I didn’t care for were cutting the cover boards (not to mention measuring them accurately, which unfortunately didn’t happen), punching the pages, drilling the cover holes, and the relatively time-consuming process of applying and waiting for acrylic medium on the covers to dry, and then applying and waiting for the final acrylic varnish coat to dry (though I now really like the result of the strong, thoroughly protected covers). There’s also the matter of discovering – after I had completely finished binding the larger, more time-consuming volume – that I had inadvertently bound two signatures out of sequence, so I had to cut it all apart and start over! Oh, well – it was a recoverable error, and the thread tension of my second attempt is more consistent, so the spine looks better anyway. Coptic-bound spine, which I unfortunately had to stitch twice. 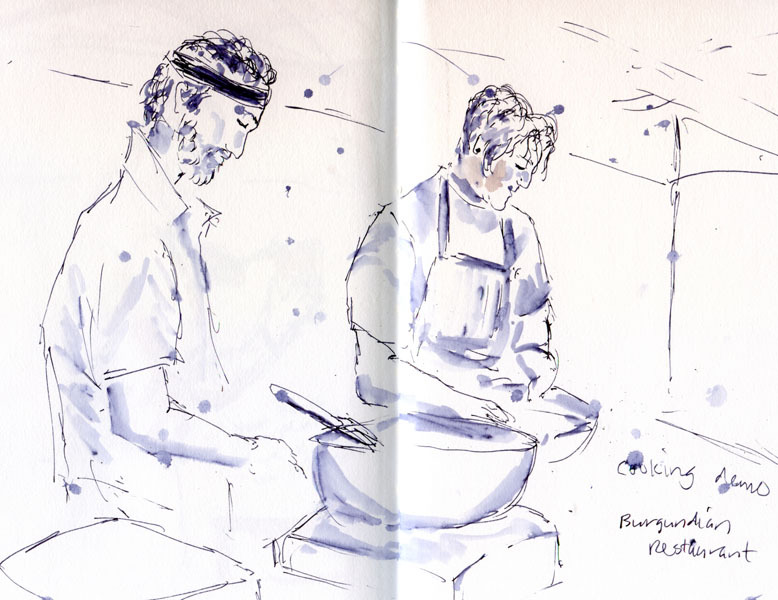 I currently fill Stillman & Birn sketchbooks at a rate of about one every couple months. That means I’ll be going through the binding process about that often. If I streamline the cover-making process to be less time-consuming, I think the Stefano system would be ideal for regular, daily use. And I’m excited about the potential for using a variety of paper types. When I finish off the Stillman & Birn volumes I’m currently working in (one Alpha and one Beta), I’ll give it a try. I suppose I could store away completed, unbound signatures during the good sketching months, and do all the binding during the winter doldrums, which would be more productive than complaining about the weather. 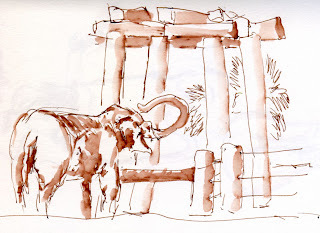 Although I sometimes visit playgrounds to practice sketching children, those perpetual motion machines are usually the most difficult of all sketching models (even more difficult than meerkats!). That’s why I was delighted to see a face painter at work at Phinney Farmer’s Market yesterday. Cookie the Face Painter has a way with kids: She gets them to sit still – at least for the few minutes it takes her to create a fanciful design on their faces. 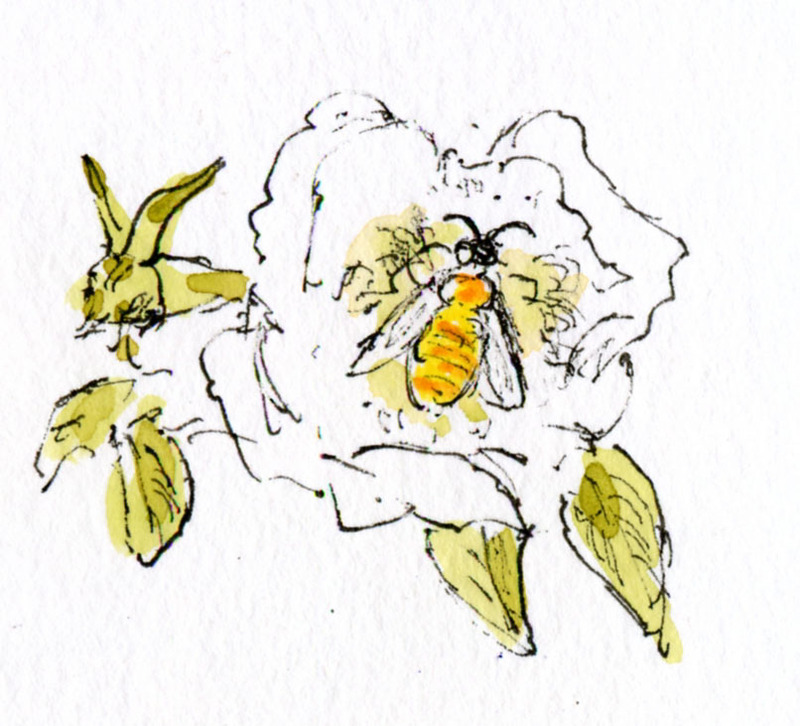 She’s so fast, in fact, that she had finished three clients in the time that it took me to make this sketch. One girl was my face model, another was the body model, and the third allowed me to sketch Cookie. 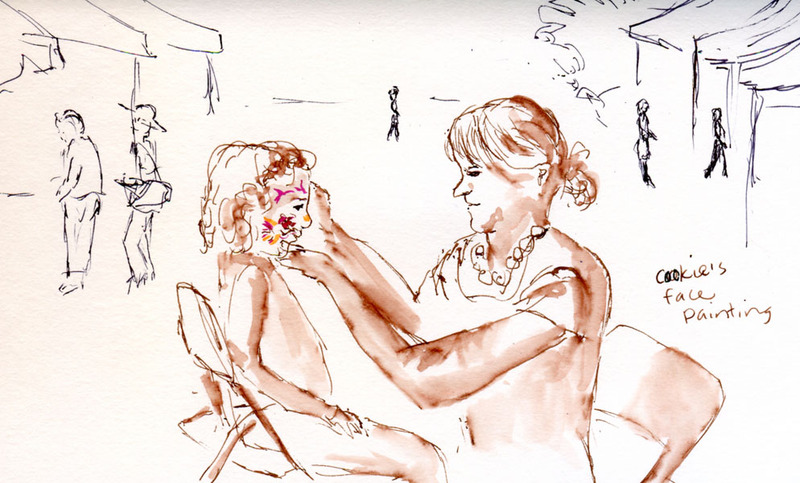 Last summer I sketched a different face painter, Alethea. That’s the note I scribbled at the bottom of my sketch of Alexander Calder’s “The Eagle,” arguably the most prominent piece in the Seattle Art Museum’s Olympic Sculpture Park. 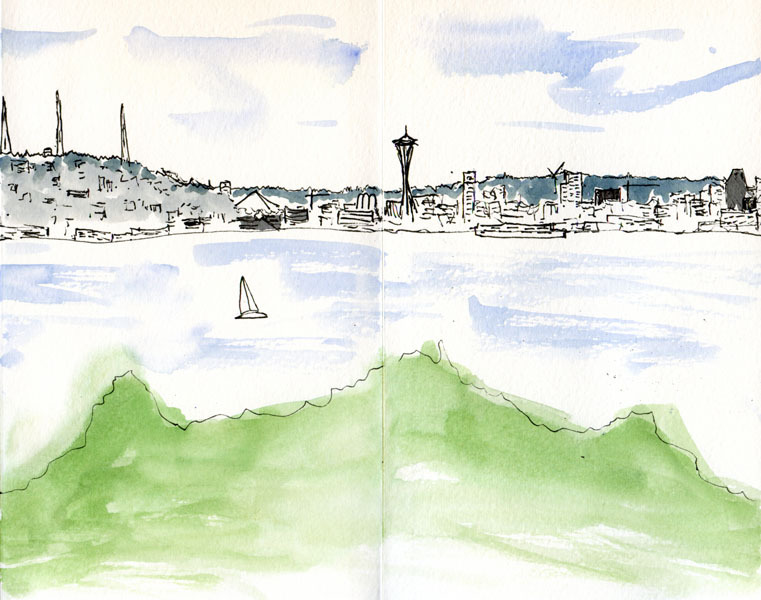 Having traveled last month to climates hotter and more humid than I am accustomed to, melting in the blistering sun every time I sketched, I am savoring the (all-too-brief) sweetness of Seattle summertime sketching at its best: Comfortable in a T-shirt but not sweating. The sculpture park was a choice location for an ad hoc Seattle Urban Sketchers gathering. 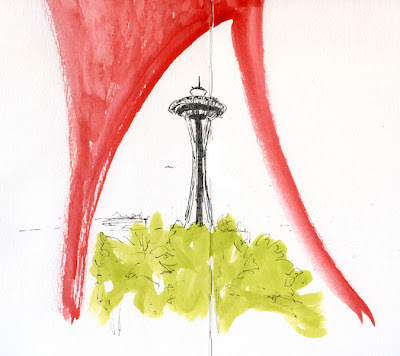 After sketching the Calder, feeling particularly patriotic to my birth city today, I moved to the other side of the bold red sculpture and faced it squarely between the legs to sketch the Space Needle. 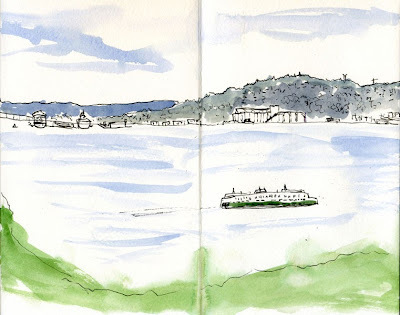 It was fun meeting and sketching with Paul and Ann Lusch, visiting from Michigan, who looked up today’s sketch location on the Seattle USK blog. Whether I’m in Barcelona or at home, I feel part of the worldwide urban sketching network every day! Two sloth bear cubs were born at the Woodland Park Zoo last December, but until recently they had been out for public viewing only sporadically, so I’d gotten only brief glimpses of them, if any. 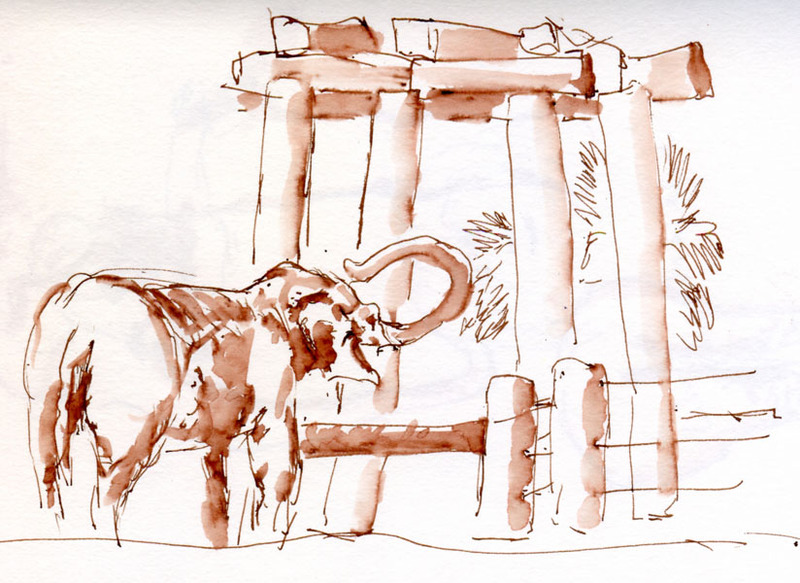 They are finally old enough to be out all day with their mom, so today I got to spend a half-hour watching them play, sketching when I could (they like to dodge behind the trees and tree-like structures in their exhibit). On my way out of the zoo, I stopped to watch an elephant being fed. 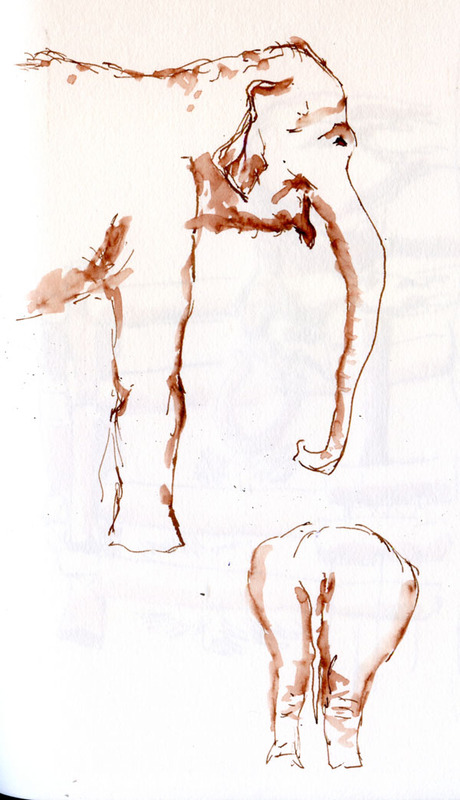 Or more precisely, I mostly saw the back end of an elephant while the front end got fed.